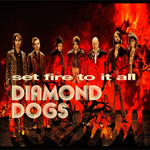 Celebrating 20 years, Sweden's Diamond Dogs release Set Fire To It All, their ninth album, and soon to follow a live concert DVD. At the heart of Set Fire To It All is the Dogs roots rock and roll forged out of the late Sixties and early Seventies. Blues, boogie, and vintage rock infects their tunes, which are laced with spry piano work from the Duke of Honk and saxophone from Magic Gunnarsson. Mostly, this is happy, party music; the songs are often lively and bright, with On the Sunny Side Again, both an example and description of this characteristic. Mama Let the Mad Dog Run, Bad But Not Ruined, and the groovy The Inner Jukebox Blues are simply fun tunes, the Diamond Dogs at their earthy roots rock best. Later, Stand By The Rhythm and In Each And Every Ballroom celebrate both their love of the vintage rock and desire to perform it. Diamond Dogs are in a league of their own; you'll be hard pressed to find many bands revisiting this style of classic rock or doing at as well. Set Fire To It All is another fine album. Quite recommended. Diamond Dogs are in a league of their own; you'll be hard pressed to find many bands revisiting this style of classic rock or doing at as well. Set Fire To It All is another fine album.